Nathan: Just how smart are monkeys and elephants? Just how smart are monkeys and elephants? That certainly is an interesting painting, and though it looks like it may have been done by a finger painting toddler, I'm sure that it's quite an accomplishment for the elephants. From the modern art point of view, it can be an exploration into the mind of elephants; does that represent a person sitting cross-legged? Perhaps they are lowering their head...signaling submission? To what? The elephants? Do the elephants want to take over the world?! Yes, although this may have some sinister, deep meaning, the elephants are probably doing nothing other than expressing themselves on canvas, and this is probably what their minds look like. Now, as we see here, it would seem that some elephants, this one in particular who is name Gonkham, actually have a bit of a flair for art among their kind. 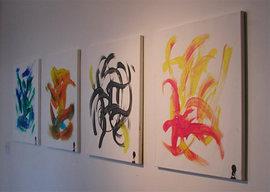 I question the legitimacy of these paintings, because not only are they at the kind of quality that older Elementary school students deliver, but I also wonder how an elephant can control a brush in their trunk in such a way as to make such very fine art (for them). 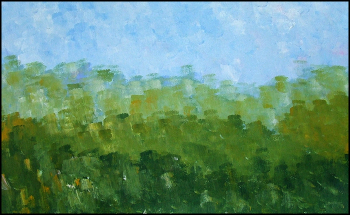 In particular, one elephant by the name Duanpen does most of the landscapes and all of the good ones. His art, below on the right, is just amazing for an elephant. Now, what elephant has the attention span, fine motor skills, visual techniques, intelligence, and forethought to be able to make something like that? Does Duanpen? Monkeys can draw art too, don't forget, I just wanted to describe elephant art first. 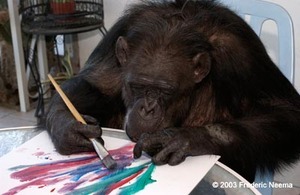 The main website that I found for art by monkeys is cheetathechimp.org, the home of the world's oldest chimp, Cheeta. Cheeta is 74 now, which is probably how he has this much art experience and patience. 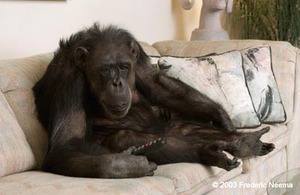 As with many bright chimps, Cheeta has been extensively educated as far as chimps are willing to go, and lives quite a normal human life, despite the fact that hes a chimp. You could probably compare his life to that of an older toddler. 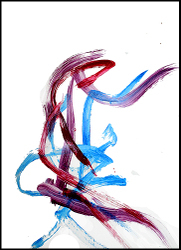 His paintings, although much less convoluted than the elephants, are still scribbles, albeit colorful ones. His pet humans often will put a canvas and some paints down when he has a whim, and Cheeta readily creates a mosaic of most scribbly scribbles. 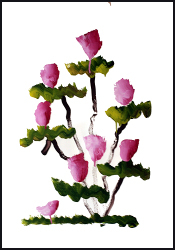 I don't think that Cheeta's art is nearly as improbable as Duanpen's or Gongkam's landscapes and portraits of fields and flowers, especially because it seems so natural for the chimps, and because Cheeta wasn't exactly born yesterday. Well, it is interesting to contemplate how intelligent some animals really are, or how intelligent they can be made to become. Some gorillas, such as Koko or the other whose name I forgot, have learned sign language and English typing, respectively. I wonder how intelligent one could become if raised from birth with humans...after all, their brains are just as big, if not bigger than our brains, at least size-wise. I got all this information from the websites I linked to above, and I stumbled across these websites while reading the Popsci blog at popsci.typepad.com. They had made a sarcastic refernce to the creative abilities of most modern office workers.